Diapers, goodbye! Potty training has commenced! Up until last week, my toddler son had successfully avoided anything to do with the potty. Like many toddlers, he stubbornly refused to use it, or in his case go anywhere near it. He had the mindset that if he ignored the potty, it might just go away. Then, there was the insistence that we had the wrong potty at home. The little Pooh potty that his sister used when she trained was not good enough for him. He had, unfortunately, noticed a Cars potty one time when we were purchasing diapers. That's the potty he wanted. No Cars potty - no deal. I avoided buying the Disney Pixar Cars Rev and Go Potty for as long as possible. The potty has a number of negative reviews online, and, being a reviewer myself, I didn't want to spend our money on a piece of junk. We tried to convince him to use the big potty or try the little one we already owned. But, nothing worked. Once again, No Cars potty, no potty period. We finally broke down and bought the thing. With the help of a few Matchbox car incentives, my son used it and now wears his big boy underpants. Potty training success - both #1 & #2. The problem is the urine puddles. I'm sick and tired of cleaning up the mess from this poorly designed potty. The engineer in me wonders how it made it through quality control. Did they even test the potty out with little boys? It's a Cars potty, a product that is mostly marketed toward boys, and yet there's really no splash guard to speak of and the potty leaks something fierce. My son is pretty careful holding and aiming (for a two-year-old) and if he sprays anywhere near the top of the seat, the urine leaks down in between the cushioned seat and the removable basin right onto the floor. Urine also collects in a shallow rim around the edge of the potty. 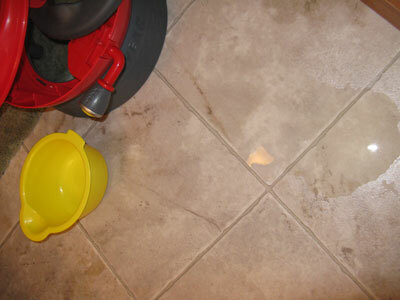 Puddles all over the floor, wet socks -- POTTY NIGHTMARE! Obviously, the idea of a Cars potty appeals to kids. It's fun, colorful and has a neat-o pretend flush shifter handle that makes race car noises. 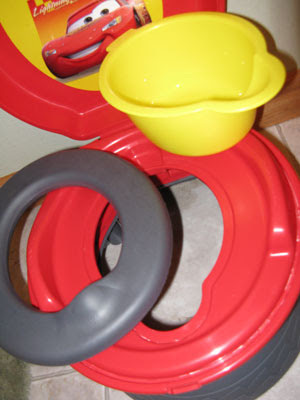 While it's nice that the top part can be removed and snapped on top of an adult potty as a trainer, that part of the design isn't helpful if it causes the main potty to leak. As frustrating as it is for me, my son loves the potty, so it looks like we're stuck with it for a few more months until I can convince him to use the adult potty. Do you have any potty training woe stories? If you're wanting to stick with the potty, think about getting some dog pads--they can keep the contents of an adult dog's bladder contained and easy to clean (get the adult ones, not the puppy trainers), so putting them under the training potty might help with the leaking. You'll still have to clean the thing itself, but you won't have puddles on the floor! I'm so glad that your baby is doing well at potty training. Sorry it's a nightmare with the potty. maybe you could shoot the company an email? oh no! we bought the same potty but have not had any success yet. It is a cute potty though! I know exactly what you are talking about! Uggg! I returned a potty once because of the leaking. Gee wiz! I hope he starts using the adult potty soon for your benefit. Maybe try and teach him how to stand. My son's both took off with training when they stood on a step stool, hung on to the lifted up seat, leaned over and peed. They love seeing the "bubbles" they make. Oh my. I can sympathize. In all of my days of child rearing, I have never seen such a cool looking potty seat. I would have gotten one for my grandson who loves cars but now I've learned of it's disappointment. Thanks for the heads up on this potty nightmare! As for your leaky issue...that's really lousy :( Maybe you can get some puppy wee-wee pads and put them under the potty so you don't have to clean the floor up...you can just throw them out and put a clean one down. I don't have any potty woes yet since we haven't started training my daughter yet. She'll be 18 months in February and I plan to start sometime in the spring when the weather is nicer for her to run around with no pants on if necessary. We've started some introduction and showed her the potty the other day when she was having some constipation issues. She was very interesting in it, but wouldn't stay on it for longer than a few seconds. I also am excited to have found a "peeing" dolly complete with dolly-sized potty on clearance at Wal-Mart for $10. Since my daughter is really into feeding her dolly and taking it's clothes on and off I'm hoping the dolly potty will help! Glad he finally decided to give it a try with this one. Boys seem such harder to potty train to me. The pet pads should help with the mess until he's fully trained to use the big potty. We started about 2 weeks ago!! My little one is almost 2.6 and I decided to put him straight onto the loo...giving the potty a miss. It's going very well I think! 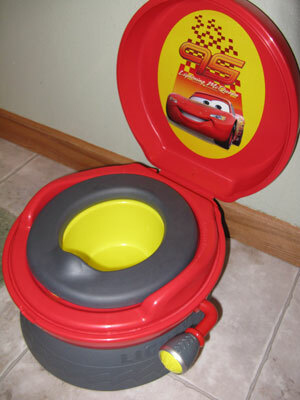 I laughed out loud when I saw this potty, because I found it online a few weeks ago and was trying to tempt my son with it too (he's a HUGE fan of Disney cars and refuses to use his two different potties we already own). He peed in the potty this week, but only after we were playing hide and seek with him with no diaper on for 1/2 hour until I could tell her needed to go. Since then, when he wears his pull-up, I can never get him to use it again. So I guess I will wait for summer. In a way, I think I'm too lazy to fight this battle!